Proposes to increase the mileage of fixed guideway transit from the current 27.6 miles to 383 miles (!!! ), a net addition of 355 miles. Depending on the mix of technology (light rail, commuter rail or bus rapid transit), this will cost in the range of $16 to $36+ billion (Tory note: that's building two+ NRG Stadiums every year for 30 years! ), with an annual operating cost around $500 million (!). Metro’s 2018 operating budget is $620 million. 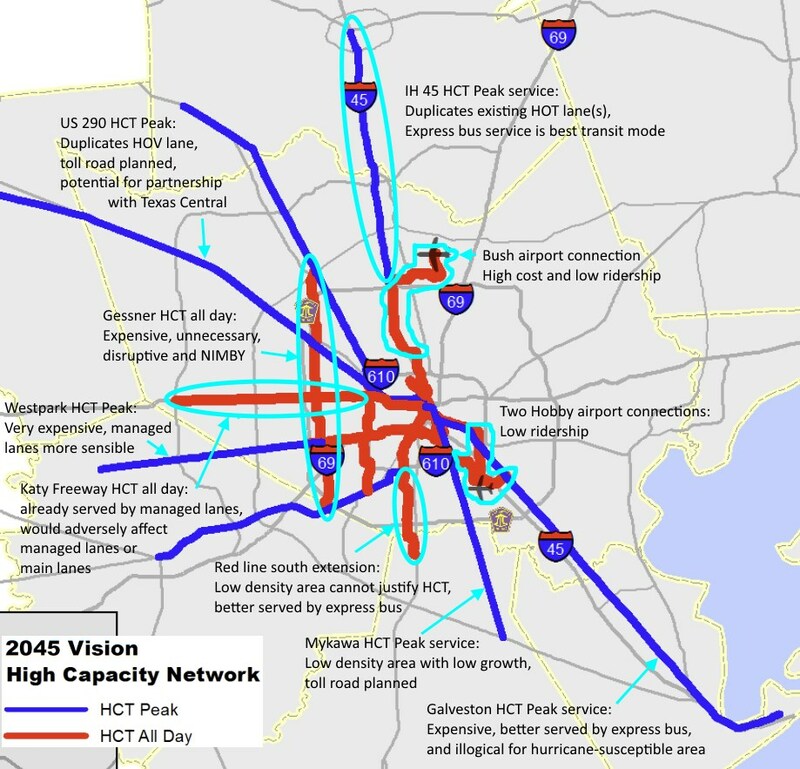 Most of the commuter lines would parallel nearby existing HOV lanes, and many “High Capacity All Day” routes (light rail or BRT) serve destinations with very low ridership, including the airports (DFW airport gets a pathetic average of 7 riders per train!). This massive investment would likely suffer from low ridership on most of the system, similar to the very low ridership of Metro's purple and green lines. This plan, or a subset of the proposed routes, would almost surely require a large tax increase and end the General Mobility transfers, which could force local governments to increase taxes. In consideration of likely disruption of transportation in upcoming decades due to ride services, electric cars, and vehicle automation, this massive expenditure will be hugely wasteful. A better solution is much-less-expensive MaX lanes, a system of managed lanes for buses, toll-paying vehicles and potentially automated vehicles. Let's hope this preliminary draft gets scrapped and we see more innovative - and affordable - thinking in future drafts. "It seems like the US 90A, BNSF-Tomball, Pearland and UP-Galveston lines are envisioned as commuter rail, since those routes follow rail lanes, not freeway/tollway. The Northwest Freeway route appears to be on the Hempstead corridor, also probably commuter rail (or possibly on the tollway (if it is built) or maybe on the Texas Central track). Several of the HCT Peak routes are obviously light rail since they are continuations of existing routes, including the Bush and Hobby routes. The Gessner route could be LRT or BRT, not MaX. That leaves only the following candidates for MaX: Katy Freeway HCT All Day; Westpark HCT Peak; North Freeway HCT Peak." Ok let's talk about the elephant in the room, Amazon's rejection of Houston for its HQ2 top 20 finalists list, validating Oscar and I's prediction (my key point: nobody wants to compete with energy companies for tech talent when oil might shoot up to unknown highs at any time!) I don't think it's anything we need to panic about - I'm sure the freak timing of Harvey was the dominant factor. It's also important to remember that economic incentives are driven far more at the state level than the city, and so Amazon wants a wide range of states in the bidding war. Amazon knows that by including cities like Indy and Columbus, Indiana and Ohio will go all-out on incentives, which they can then leverage over more desirable locations that aren't as likely to play the incentive game (NYC, DC, Boston, LA, Denver, etc.). It doesn't mean they're more desirable locations than Houston. Houston was not needed because Texas is already in the game with DFW and Austin, which are honestly better fits for Amazon if they choose Texas. DC, Northern Virginia, and Maryland all made the final cut - lots of options. Bezos has a home there and owns the Washington Post. Most importantly, it's perfect from a talent perspective: DC is filled with underpaid and disillusioned government workers (including tech) - so it will be easy pickings. In fact, I think an argument can be made that taxpayers are likely to be screwed twice over: once for the direct incentives, and a second time as the government has to raise salaries to recruit and hold on to tech talent in competition with Amazon. "The cities which made this list may also regret it. Putting together an initial bid only required a limited amount of money and civic time and attention. Now the costs start going up for the losers. It may well have been better to be one of the people who got cut early than to keep making through all these rounds only to lose (or potentially even to win)." We're saving a lot of resources we don't have to spend on a losing battle, or even risk the "winner's curse" for whoever does win the bidding war. We'll just keep growing with lots of small under-the-radar wins like we always do. I'm not saying we don't have work to do as a city to attract more tech talent and companies (something Houston Exponential is directly addressing), but let's not blow this up to be more than it is. Houston is doing fine - more than fine - and most cities would kill to be growing and thriving like we are. Amazon was an unnecessary distraction. - let them cause havoc (talent poaching, driving up home prices, increasing traffic, draining tax incentives) somewhere else (Why You Shouldn’t Wish for Amazon’s HQ2 in Your Town). Update: This Washington Post analysis includes why Houston didn't make the cut. Note that they give our transit high marks, as opposed to those who bias rail over bus. Update 2: My thoughts on Dallas vs. Houston for Amazon HQ2. Update 3: Texas Monthly backs us up on our creative "think big" Astrodome Amazon HQ2 idea! Also from the Guardian: California and NYC are shipping us their homeless with bus tickets. Next time you dismiss Houston's cost-of-living advantage: A report from the University of Southern California and the Los Angeles Business Council published earlier this year found that exorbitant housing costs in Los Angeles were inhibiting employers from attracting "high performers" or top talent to their companies. "About 60% of the employers surveyed said Los Angeles' high cost of living affects employee retention, with 75% naming housing costs as a specific concern. And nearly all said they viewed high housing costs as a barrier to hiring new mid- and upper-level employees." Houston and Texas look pretty strong in the inter-city migration graphs here! Silicon Valley will soon see a 'mass migration' of tech companies and talent, says Redfin CEO - Cities like Denver, San Antonio and Houston are primed to be the new hubs, he said. Let’s talk transit – and ideology. 2) Enforcing congestion charging, so that road use is priced based on driver demand. This would incentivize people to locate closer to their jobs, or commute in using different modes besides solo driving. 3) Liberalizing private transit from pointless bans and regulations. This would cause the industry to grow, namely through “micro transit” options like rideshare, bikeshare, carpool, ebikes, shuttles, dollar vans, etc. 4) Reforming public transit. Many Market Urbanists aren’t against public transit, per se, but think that transit agencies must improve their management and services as a condition to get more funding. And if they are unable or unwilling to do this, cities should seek privatization, by signing short-term, performance-based contracts with outside companies. All 4 of these market-based policy ideas are politically unlikely. But if any or all of them were applied, there's no doubt in my mind that many cities would have higher transit usage...because transit would be way better.